The People's Republic of China has a land area of about 9.6 million sq km, and is the third-largest country in the world, next only to Russia and Canada. It is located in East Asia, on the western shore of the Pacific Ocean. China's terrain descends from west to east. In the west it has the Qinghai-Tibet Plateau. Mt. Everest stands above the world at a height of 8,848 meters ( about 29,029 feet ) above sea level. 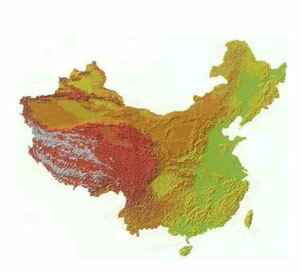 The Yangtze River and the Yellow River are the two most important rivers in China. The Yangtze is 6,300 km (3,914 miles) long, the largest river in China, and the third longest in the world only after the Nile and the Amazon. The Yellow River is the second-longest river in China, 5,464 km (3,395 miles) in length. Grand Yarlungzangbo Canyon in Tibet is the largest canyon in the world, 504.6 km (313 miles) long and 6 km (3.7 miles) deep. The Grand Canal, running from Beijing in the north to Hangzhou in the south, 1,801 km(1,119 miles) long, is the longest as well as the oldest man-made waterway in the world. China has a population around 1.3 billion, about 21% of the world population. China has 56 ethnic groups. The Han people make up 91.96 percent of the country's total population. 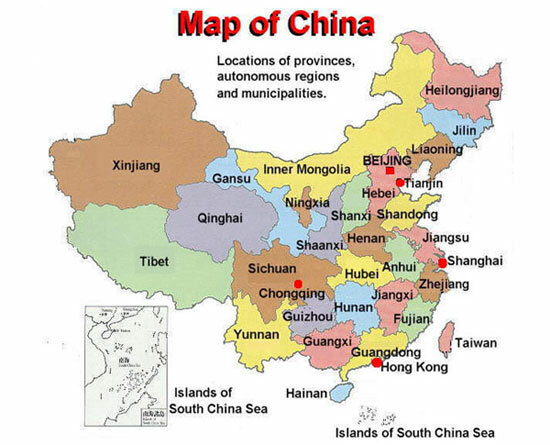 The official language in China is Pu Tong Hua (mandarin). All 55 minority people have their own languages except the Hui and Manchu, who use mandarin. 21 of the minorities have written languages. There are over 56,000 Chinese characters. However, only about 3,000 characters are in common use. China is a country with great diversity of religions. The main religions are Buddhism, Taoism, Islam, and Christianity. Copyright © 2011-2017 Artra International LLC. All rights reserved.